The Rinspeed Etos concept featured this ZF TRW retractable steering wheel. Though the steering wheel's origins are murky, race driver Alfred Vacheron signaled its ascent when he drove a Panhard automobile in the 1894 Paris-Rouen race. From that day forward, the days of the clumsy, nautical-derived tiller were numbered. Today's steering wheel has evolved into a high-tech, electronic device with numerous added functions. But its basic job of controlling the vehicle has changed little. Within the last year, major automakers -- including Volvo and Mercedes-Benz -- have shown concept cars with steering wheels that retract when the vehicle is driven autonomously. Some suppliers have developed systems to enable that transition. 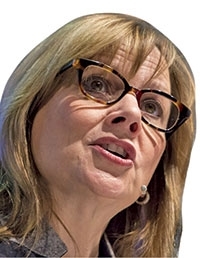 General Motors CEO Mary Barra said last week that vehicles should keep traditional features such as steering wheels and pedals during the transition to fuller autonomy: "We think that having that capability when the steering wheel and the pedals are still in the vehicle is a very good way to demonstrate and prove the safety." Beyond that, Google's famous pod car dispenses with the steering wheel altogether. These days, an acronym-happy industry likes to use expressions, such as "HMI" for human machine interface. As HMI goes, the steering wheel is about as good as it gets. James Hotary, director of xWorks Innovation Center of Faurecia Automotive Seating NA, said the steering wheel's iconic place controlling the vehicle might not last forever. "I think we're in many ways stuck in the paradigm of a steering wheel," said Hotary in response to a question at the WardsAuto Interiors Conference in May in Detroit. "On the one hand, it's a pretty darn good input device. It's comfortable. You can put your hands in a bunch of different positions. It has stood the test of time. Completely autonomous vehicles are not going to be around anytime soon." But, says Hotary: "What happens when all of a sudden the manual part is the less-common-use case? Why are we keeping this legacy device around?" "Because we don't expect to imminently give up control, you're still as a driver going to want that familiar, comfortable steering wheel," said Jeremy Carlson, IHS Automotive principal analyst for autonomous driving. "But that doesn't mean you won't see plenty of innovation happening there." 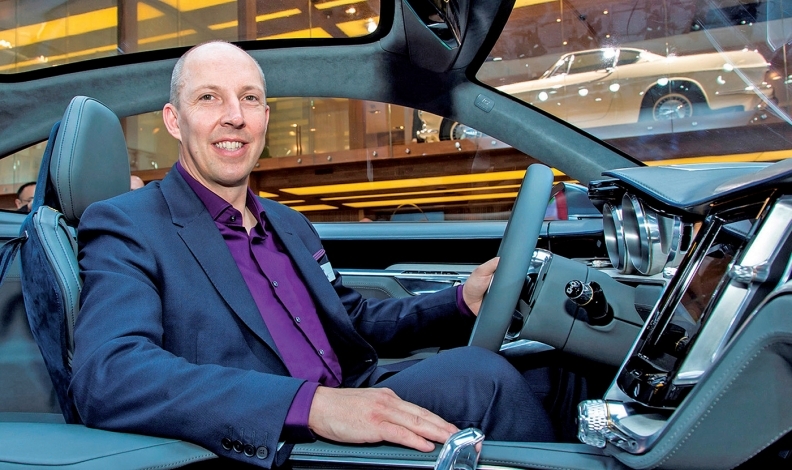 "Being able to get back to that steering wheel ... that's comforting," says Robin Page, Volvo chief of interior design. "People need to get used to autonomous drive, so being able to get back to that steering wheel and grab hold of it, that's comforting. We decided to have it there a recognizable icon." "There's a lot more complexity being added to the steering wheel from an HMI point of view," said Richard Matsu, director of engineering for Autoliv Inc., a Swedish supplier of safety systems and one of the world's largest makers of steering wheels. The technology allows the car to know where the driver's hands are placed and also would permit carmakers to program functions into the wheel, allowing them to eliminate mechanical switches and knobs on the instrument panel. Says Matsu: "Many vehicle manufacturers want to know if your hands are on the wheel. They need to understand the driver's condition regarding active-safety functionality." Matsu says Autoliv is talking to automakers about development of the zForce technology. Barra: Steering wheel, pedals "a very good way" to prove safety. Volvo's Concept 26 vehicle, which debuted in November at the Los Angeles Auto Show, features a retractable steering wheel. Robin Page, Volvo chief of interior design, says Volvo chose to keep the familiar shape of the steering wheel. "We wanted to keep that recognition of a round steering wheel," he said. "People need to get used to autonomous drive, so being able to get back to that steering wheel and grab hold of it, that's comforting. We decided to have it there as a recognizable icon." In its Vision Tokyo autonomous concept shown at the Tokyo auto show last fall, Mercedes-Benz showed a Connected Lounge in which occupants sit on an oval couch. The concept allows multitaskers to go about work or play in congested urban environments such as Tokyo. There's an oblong steering wheel, but it almost seems like an afterthought. IHS's Carlson is skeptical about such intermediate steps as the telescoping, or retractable, steering wheel ever being widely produced. "I don't see this telescoping steering wheel being very popular anytime soon, other than as a concept of what the vehicle could look like. When we talk about that process of moving from automated to autonomous, it's going to be a long, drawn-out transition. These types of vehicles will coexist on the road for a long time."